The main lawn of the 9.6-acre Paris-style park behind the New York Public Library in Midtown is already filled with people waiting for tonight’s free movie on an enormous screen. Children ride the merry-go-round, Le Carrousel, while parents snap photos. Young professionals crowd the outdoor cafe, one of Midtown’s prime meeting sites. Every small green table along flagstone walks is taken by people eating an early supper, chatting and computing. 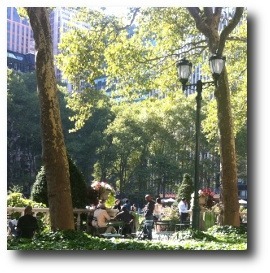 Whichever route I walk home, I start by taking a diagonal stroll through Bryant Park. It’s peaceful. It gets me ready for the push-and-shove of Sixth Avenue. At various times a potter’s field, soldiers’ parade ground, scene of draft riots and anti-war protests, Bryant Park reached bottom in the 1970s, when it became a notorious lair for drug dealers and prostitutes. Then, as happened to Central Park and Riverside Park, volunteer leaders stepped up and demanded better. Through a combination of private and public money, they cleared out the dealers, redid the grounds, brought in summer flicks and winter ice-skating, and turned a nightmare into a jewel. In other words, we know how to turn desperate situations around. It takes leadership, not politicians chasing donations. It takes people willing to work together, looking beyond the silos of their self-interest. In our current political climate, it is difficult to conceive of something so selfless and unifying taking place. And yet this is exactly what we need. Not millions being poured into attack ads, not empty suits chasing votes with whatever words will play well on the evening news, not bottomless distrust and division. Certainly not the thinly veiled calls to violence now emanating from the right wing. If we want to see a nightmare become a jewel, we need selfless leaders and collaborating citizens.